A default replacer for Nords with new (seamless) head meshes and textures. perfect, but a step in the right direction. Other races will be re-done as well, but it might take me a bit more time than I thought (which is why I`m releasing this, as a precaution in case something goes awry). REQUIRES BB MESHES. NO EXCEPTIONS. Hairs are NOT included, as I haven`t had time to make any. It`s an even more time consuming process than heads IMO, so for now they are not planned. 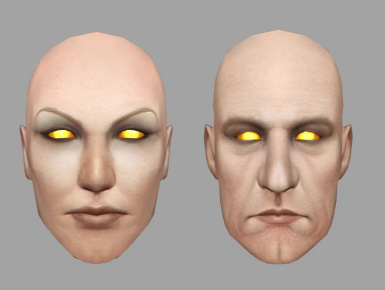 These heads are about the same size as default/standard replacers, so hairs you already have should fit just fine. have to do is open the hair nif with Nifscope, remove the ear parts from the hair (block-remove branch), save and that`s it. Feel free to start making your own custom heads - that`s what meshes are there for. like little "pieces of art". Credits go to Psychodog studios for original BB meshes and Hrchnamd for editing the neck area and general head-to-toe fitting.